• A contemporary Christmas photo ornament a family will cherish. 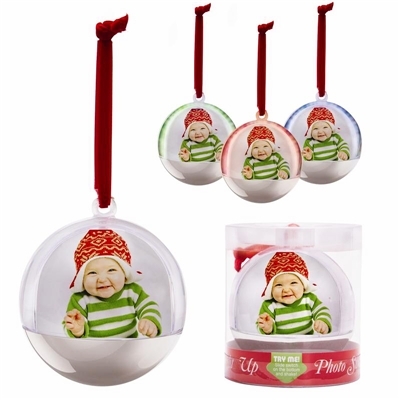 • A clear round ornament ball that's sliver on the bottom. • Just ''Shake'' it to activate its blue/green/red LED lights. • Mount 2- 2" x 1-3/4" curved photographs. • LED lights flash & blink for up to a minute. • Packaged ready for retail sales. PS1780X Christmas Light-Up Photo Ornaments $60.00 for 12 globes. A clear round ornament ball that's sliver on the bottom. Just ''Shake'' it to activate blue/green/red LED lights. Mount 2- 2" x 1-3/4" curved photos. LED lights flash & blink for up to a minute.